Expansion is inevitable. The key is to know which way you want to expand yourself, and to be in command of your energy enough to deliberately expand in positive ways. None of us can ever get rid of our shadow side completely. But you can identify and cultivate what is beautiful in you; what is most effective in your habits; what your strengths are; what the unique gifts are that you have to offer. Then with a yogic and meditative mind, deliberately move your energy so that the beauty in your life grows and grows. It’s a matter of where you put your attention. I invite you to meditate on ways you want to expand into the Age of Aquarius. Identify the best in you, the most beautiful aspects of your life – and use the powerful expansive energy of the sun to propel yourself into a positive and prosperous future. Copyright Ek Ong Kaar Kaur Khalsa, 2011--2013. Join her amazing webinar course called "Success and the Spirit", either live or recorded at www.SoulAnswer.com/success.html . It is the nature of life that light and love exists in the world, as well as darkness and pain. We find ourselves, as humans, constantly navigating between the light and the shadow. Whatever shadows we face inside ourselves often come from events that happened to us. Events that hurt us so much, we shut off our sensitivity. This results in living only a half-life, where we become much smaller and less powerful than who we truly are. Yogi Bhajan once said about the soul coming into the body, “It was never promised that you would not get hurt. But it was promised that you would have a chance to heal.” When we get in touch with and trust the ability of the soul to guide us, the path of self-healing has a chance to reveal itself. From my own experience, I have observed certain principles about how our soul creates the map to our own healing. 1. We only heal what we are ready to heal. The soul will only present us with the next step it knows we can take. The catch-22 of this is that sometimes the most challenging wounds will not reveal themselves to be healed until we have done a lot of work on ourselves. In this sense, self-healing is a gradual and accumulative process. The journey allows us to build ourselves up so that we have the strength to go deeper. 2. The soul works wholistically with the inner and outer environments. If we can recognize our entire experience of life as an expression of Spirit, then the soul constantly uses the situations around us to reflect back how we are doing with our healing journey. 3. The soul will guide us at a pace we can handle. There is no rush in healing. No need for crisis. There is no goal and no finish line. We have the right to take our healing journey at our own pace, without it becoming overwhelming. Self-healing can be incorporated as a balanced and integrated part of life. Crises happen when we do not pay attention to the journey our soul is trying to take us through. But with the right intention, and the commitment to give this journey the time and space it needs, self-healing can be a positive part of a full and satisfying life. 4. Healing is not an “All or Nothing” game. Self-healing is the journey to become more and more whole. At every step, we can honor what we have achieved. People are simultaneously healthy and healing at the same time. Sometimes, healing is like house-cleaning. Sometimes, it is like a renovation. Every step, we gain something, and there may be another step to take. Never feel frustrated by the fact that you “aren’t there” yet or “it isn’t finished” yet. The soul wants to express itself FULLY in time and space. This is what it means to be “free.” To be “liberated.” Self-healing allows the soul to gradually become visible and present to the conscious mind, and to time and space. Allow the unfolding to continue. There is never a limit. These are the some of the principles that the course, “Unearth Your Personal Map to Inner Healing” is based on. I hope you will consider joining me at Soul Answer University for this unique webinar, where you can look within yourself, and begin to understand the Infinite capacity you have to heal yourself. A dear friend of mine and I were talking recently about the tragedies that people go through in life, and how often we can get stuck. The pain involved in loss and trauma can become so overwhelming that we stay frozen in time, reliving the past. Each moment we loose ourselves in old feelings and memories is a moment that we cannot embrace the here and now. Trauma, loss, pain and suffering can drain the life out of you like a psychic vampire. There are a lot of tools out there to help people express their past traumas and aunguish: 12-step programs and group support systems; counselors and therapists. There are even drugs that selectively repress the body chemistry responsible for emotional pain. It is my belief that many people seek out yoga and meditation as a way to heal the pain from their past. Through yoga and meditation, we open the chakras, raise the Kundalini, and directly experience the Divine energy of the ethers. All of this can have a tremendously soothing effect on an internal nervous system that never stopped reacting to a mental, emotional or physical violation held in a persons's memory. Often, the healing process can become an inner loop where we feel the pain from the past, find a way to express it, and gain a temporary sense of relief. Yet, the deepest healing happens in the moment where the memory gets transformed somehow so that it no longer hurts when we remember the event. Getting to that moment of transformation is a very deep process. The practice of Kundalini Yoga creates a path within so we can experience that moment of transformation. One of the main discoveries I have made in my own healing/spiritual journey over the last 25 years is this. Inner healing starts with building a new room. When we are traumatized on any level, that trauma, and our reaction to it becomes part of our self-definition. It is "who we are" on some level. The more the trauma defines us, the more trapped we are in the remembered pain of it. But who we are is actually an Infinite Ray of Divine Light, who came to earth in human form for a specific reason. We are not the pain and the trauma. We are creatures of an Infinite and Loving Consciousness. And there is a Divine purpose to our lives. Some level of healing and relief happens when we face those moments in our past and cry over them, fight about them, argue with them, or wish they had never happened. But the most tranformational healing happens when we begin to build a sense of our identity unrelated to the trauma, originating from the Divine Self within. When the room of this new self-identity is built to a certain degree, when the "I" caught in the pain actually has somewhere new to move to, then we can look that trauma square in the eye and allow it to transform into something that will always be part of us, but will never define or rule us. How does one build such a room? It is takes time, and requires different skills and a different understanding of the self. One simple place to start: if today you are dealing with the pain of a past traumatic event, ask yourself: what do you love about yourself and your life that has never had anything to do with the trauma? Meditatie on it. Write a list. You could find yourself opening the door to another possibility for how to see yourself and define your life. Ek Ong Kaar Kaur Khalsa will teach a multi-class webinar through Soul Answer University titled Activate Your Inner Healing Mandala. Part 1 will take place on Monday evening, July 9, 16, 23 and 30th, 2012. Part 2 dates will be arranged. Visit www.SoulAnswer.com/healing_mandala.html for more information and to register. The Mystical Process of the Divine as Described in the Mool Mantra. Not that we shouldn’t set boundaries or fight injustice. Guru Gobind Singh was a master of seeing the Divine on the battlefield, of praying to every aspect of the Creator while wielding his sword. It’s more about the way in which one sees life. Anger and fear cannot coexist with love. To fight and see the Divine in the enemy – to know the duty and yet to keep compassion in one’s heart – this is the way of the Sikh. Where fear and anger are – the Guru’s words are not. Where the Guru’s words are, fear and anger have no ground in which to grow. This, to my own mind, is the reason why the Sikhs in history could face such terrible tortures and horrors and still shine - Because they had cracked this secret of the Mool Mantra. And the experience of Divinity within themselves and within the entire creation was so powerful and so great, that even in the worst circumstances, they could see the Divine in the other person. And so they could go through the challenge with love instead of fear and vengeance. 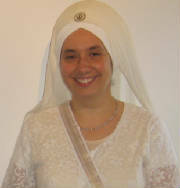 Copyright: Ek Ong Kaar Kaur Khalsa, 2006.